Helps in modeling the locality of interactions and improves performance by determining which agents will share information. 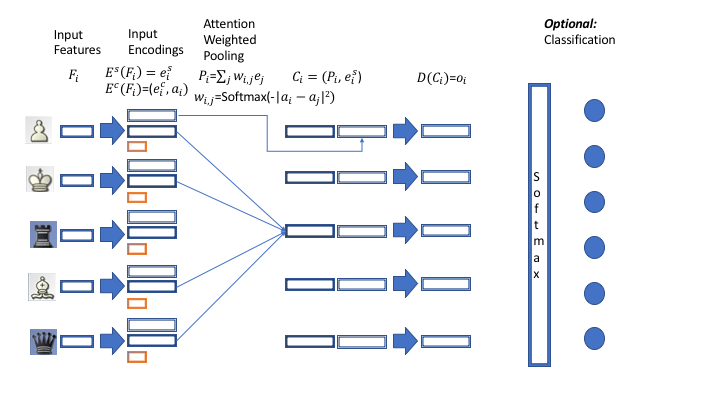 Can be thought of as CommNet with attention or factorized Interaction Networks . Can model high-order interactions with linear complexity in the number of vertices while preserving the structure of the problem. Tested on two non-physical tasks (chess and soccer) and a physical task (bouncing balls). Starts from equations of Interaction Network and CommNet and modifies them to include attentional component. Complexity: O(N2) evaluations of . CommNet: Interactions are not modeled explicitly. Interaction vector is calculated for each agent . In non-additive case, uses softmax for calculating attention weights. Benefits: An efficient linear approximation for IN while preserving CommNet’s complexity for . Refer figure for exact equations. a communication encoder to generate communication vector and attention vector. For each agent an attention weighted vector is generated from weighted sum of communication vectors from all agents. Set weights for self-interactions to zero. Concatenate feature encoding with the attended weight vector in above step to yield intermediate feature vector. Finally, use a decoder to yield per agent vector. For regression, this vector is the final output while for classification this can be passed through softmax as it is scalar. In soccer, nearest neighbors receive most attention, rest of the players also receive roughly equal attention. Goalkeeper if far away, receives no attention. In bouncing balls, the balls near to target ball receive strong attention. If a ball is on collision course with target ball, it receives stronger attention than the nearest neighbor. Outperforms CommNet and IN on accuracy results for next moving piece experiments for chess. Basically, a CommNet with attended communication vector. Tries to incorporate which communication is more important. In sparse interactions systems, the attention mechanism will highlight significantly interacting agents. CommNets will fail in this case. In mean field case, where the important interaction works in additive way, IN will fail, CommNet will work but VAIN will find proper attention weights and can improve on CommNet. Code hasn’t been released yet.